No doubt that the high-resolution images are the need these days. If you are running any kind of modern blog or magazine, you are most likely aware that some of your visitors might be using Retina displays. These high DPI devices are capable of showing images in great quality and larger size than the average screens. In order to help you out with the set up for those high DPI screens, we assembled this quick guide to help you out. Retina displays is a brand name used by Apple for its series of IPS panel and OLED displays that have a higher pixel density than traditional displays. These screens can display higher resolution photos and in order to serve images with larger resolution (double sized) just for them. The easiest way is to install a plugin that will perform the needed actions. 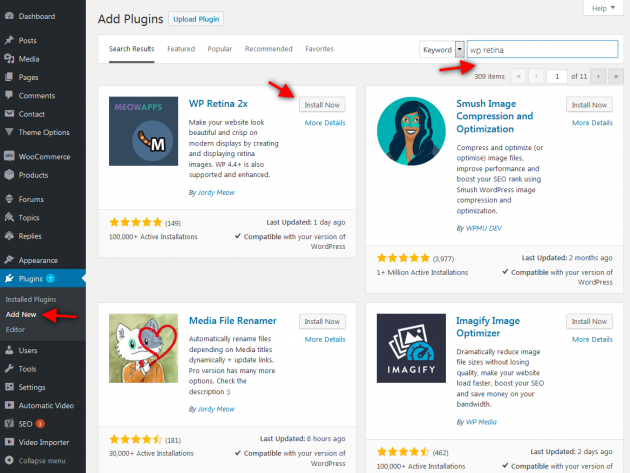 We recommend the WP Retina x2 plugin (https://wordpress.org/plugins/wp-retina-2x/). This plugin will generate the needed double sized images and will also insert the needed markup for the image elements. So, you don’t need to manually create any images, the plugin should do that automatically. Once the plugin is installed, you can access its settings inside the WordPress admin -> Settings. Then, you just need to check the desired image sizes that you want to make retina ready. The plugin will generate the double sized images and serve them accordingly. If you plan to use this script, you will need to upload it inside your themes JS folder. Then you will need to alter your theme functions.php file and use wp_enqueue_style to load the script on the front-end of your website. The script work like this, it will check if the display is Retina ready, then it will search for the Retina image that you have created manually and replace the original one in place. This is a jQuery plugin for Retina display that is similar to the Retina.js. The script calls the $.fn.dense() initializer method and it targets the img elements. So, it will serve the Retina-ready images per needs as well. The easiest way to make your WordPress blog or magazine Retina display ready is to install the WP Retina x2 plugin. If you don’t want to use the plugin, you will need more time to prepare the images, especially for the Retina displays. It will also require a small tweak on the theme in order to make it work like that.